recreate the feeling of one of the 7 Wonders of the World. arms and legs of both the top and pants. 2. A "burned out" two layer fabric of grey and black knit was used to replicate the texture created by the building ruins. 3. I researched the colors used in Traditional Peruvian Dress and found a strong influence of red and black. Colorful patterned stripes of many colors are also used. My outfit features red, black, and white and black bands of striped fabric. After choosing my fabric based on my inspiration, the next decision involved choosing just the right pattern for a pre-teen. to create the hooded top. It's called "MiniMe" by Fusselfreies. It was fun to use a Google Translate app to help me know what to do. Most of it is just like any sewing technique, but some of it is unique to that pattern. Fun challenge for me. Can't have just plain grey pants to go with this top. So I drafted the pants myself, inserting the pin tuck panel in the knee area of the legs, just like the ones in the arms of the top. I chose the curved front panel option on the pattern. This front panel on the pattern would be great to highlight words, Cricut cutout, or a preprinted panel. The white and black bands of striped ribbed knit fabric frame Miss E's face and finish the arm and bottom of the top. I think the contrast of this stripe gives the outfit a real POP! The bands of red fabric on the pants make her legs look so long and make the pants quite unique. So do you think I achieved a look that is inspired by Machu Picchu? It’s beautiful, Deborah! I love how you used different parts of the ruins and the country’s traditional dress for your inspiration. Great job on the details, too. They give the outfit so much texture and visual interest, and tie it all together! When I was at the fabric store as soon as I saw that grey and black burnout knit the outfit just came all together. Don't you just love pushing yourself to create an outfit that is inspired by the challenge, and trying new sewing techniques. Thanks for sharing your thoughts, as I wondered whether or not others would view the finished product in the same way that I saw it. This a great! What a fun look and I love the inspiration! The Peruvians' really knew what they were doing with the combination of vibrant red and black.... and throwing in those stripes for visual interest! I'm glad that you can see my vision too. I love this, great thought and inspiration behind it! No matter how great the outfit looks, if it isn't comfortable Miss E is not wearing it. I pre-washed all the different knits before I cut it out and added some fabric softener to make it extra comfy. Pre-teen can be rather picky at times. If you are anything like me....I want that top too for me. How is she getting so old???? Love the outfit and all the details in it! Yes she is growing up.... which of course brings happiness and a bit of sadness too. I have enjoyed watching your children grow up on your blog too. I always check it out to see what you are sewing for your pre-teen. The pintucks and "ruins" are so smart! I love all the details in this look! Pin-tucks aren't difficult to sew, just time consuming. You need a good steam iron and a great movie to play while you sew. Thanks for your kind comments. I love reading what people think of my sewing creations as none of my friends sew at all. Pintucks is such a great way to represent the steps! I love the burned out fabric, too. It was fun being challenged to design an outfit that was comfortable, stylish for a pre-teen, and based on an idea. Thanks for your kind words. Fun outfit! I love all the little tucks! Those pin tucks aren't difficult to sew...just time-consuming, but I like the effect too. This is amazing! Love the ways you brought the ancient forward in time to meet the modern. Thanks for sewing along again! It was my pleasure to sew along on this interesting challenge. I'm ready for the next challenge too! 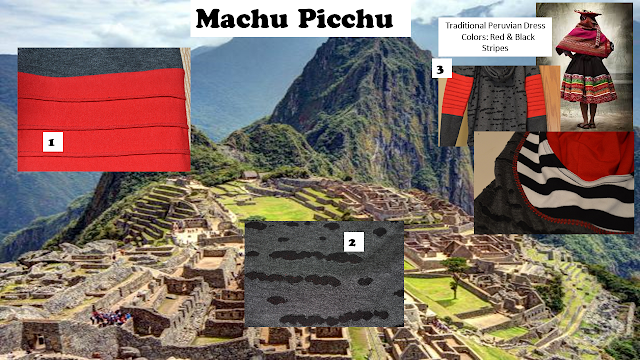 I love all the little design elements you used to make it very Machu Picchu!